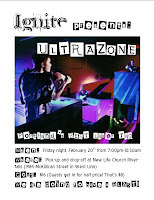 High school students are invited to join Ignite Youth Ministries (the high school ministry of New Life Church) on a Laser Tag outing next Friday, February 20 from 7:00 p.m. to 12:30 a.m. We will be going to Ultrazone for their Friday night frenzy! The cost is only $16, which is $4 less than if you went by yourself. Guests get in for $8. For more info, please contact Matt at the church office. $$$ and Medical Release Forms are due on Wednesday, February 18 for those planning on going. Don't miss a fun night with our group. This really is the best Laser Tag ever!